However, every vote does matter. Voters have many reasons to get discouraged whether it’s living in a red or blue state while supporting the minority party, wanting to support a third-party candidate or seeing a presidential candidate win the popular vote but lose the election. 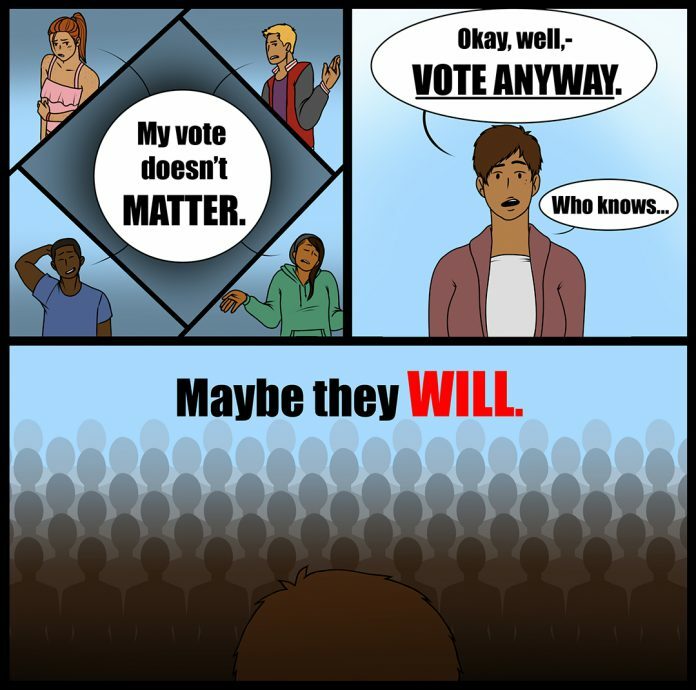 So it can be easier for people to convince themselves their vote doesn’t count rather than deciding it does. These reasons mostly stem from American politics functioning as a two-party system that encourages partisanship, picking Republican or Democrat and either mostly or completely voting along party lines. Voting responsibly and researching candidates is something that takes time, which many potential voters don’t have an interest in doing. Even though it’s not ideal, it’s understandable why some voters simplify their political stance to align with one party. And when it comes to party loyalty, the U.S. government doesn’t always set the greatest example either. Congress has become more and more infamous for its growing partisanship. For example, the recent confirmation of Brett Kavanaugh to the Supreme Court was by a vote of 50-48. The Senate is made up of 51 Republicans, 47 Democrats and two independents who caucus with Democrats. Only one vote from each party dissented. West Virginia Democrat Joe Manchin voted yes while Alaska Republican Lisa Murkowski voted present rather than voting yes or no. The confirmation was a long, contentious process that saw testimony and investigations that didn’t seem to ultimately have much of an effect on the result. It all led to the most likely outcome simply because Republicans have the votes, and a Republican president picked a nominee that aligns with Republican interests. A situation like this further fuels the fire to pick a side, Republican or Democrat, and that the only way to win is to never diverge. But democracy should be about voting for the candidate someone feels will best represent them regardless of party. The process, however, has turned into a war between two sides for control at all costs. Regardless, voters should still cast their votes how they see fit. And there is no better time than now to get involved with the upcoming midterm elections Nov. 6. While these elections don’t normally garner as much attention as the presidential election, they can directly affect voters’ lives more on a day-to-day basis. Voting should not just be about winning but rather participating to make sure everyone has a say. For those who are registered, take the time to research candidates, their platforms and participate. If change is going to happen, it’s going to start with everyone casting their ballot exactly how they see fit.